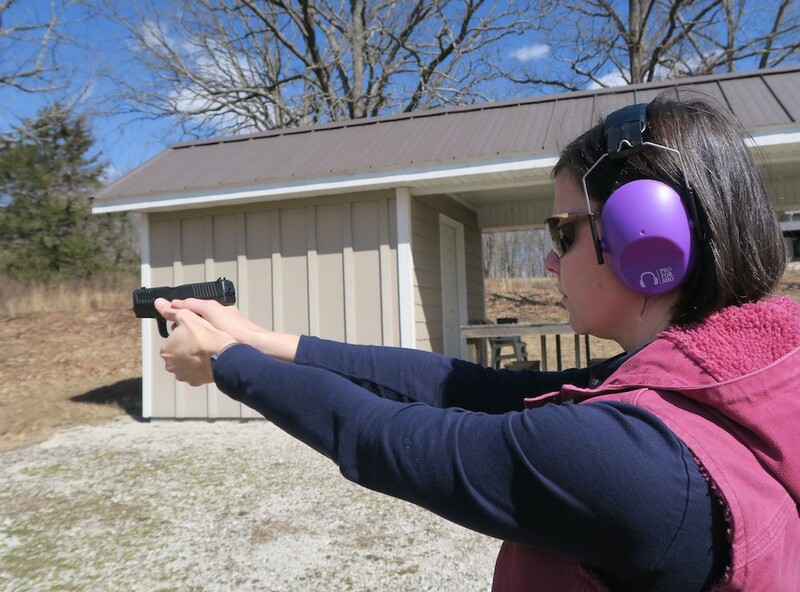 Walther Arms offers several compact concealed carry firearm options for women, which include the CCPM2, the PPQ sub-compact and this one, the PPS M2 LE Edition. Imagine my surprise, when I went to pick up a Walther at the gun store and learned that there were 3 for me to take home and review? The PPS M2 is the thinnest of the bunch, measuring a mere 1-inch width. There’s more to like about this easy-to-conceal gun. With spring and warmer weather, and fewer clothes on your body, it’s time to consider a low- profile gun, especially if you’re carrying a double-stack or another larger gun under a jacket now. Right out of the box, the reputed “Carl Walther signature ergonomics” can be seen and felt. What is the meaning of a signature ergonomics, you might ask? It’s a concept. It’s what you see when you identify a Walther by the look and feel of it, as compared to other guns. For example, the curvature of its grip, the shape of the trigger guard, the trapezoidal build of the back of the slide, the grip angle and the texture of polymer materials. When you’ve shot a Walther, you’ll identify these components easily moving forward. In fact, it might be argued that these features are what make this gun so attractive to women, along with engineering technologies. Now that we’ve established that this gun is thin – and thin is good in the concealed carry world especially, for reasons of not printing and lighter weight – it’s time to consider other reasons to consider carrying this one. 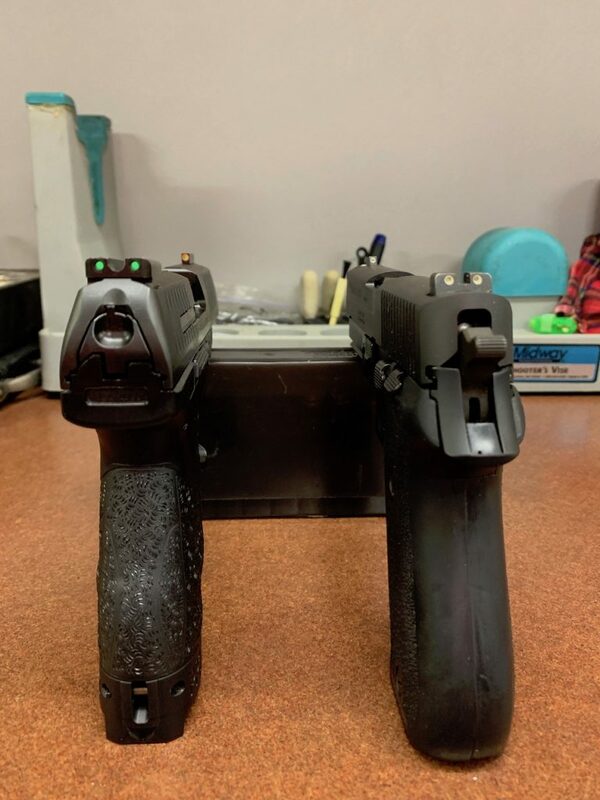 Walther PPS is on the left. Although I have waxed on about carrying a thin gun in hot weather, it should be noted that the overall design of this gun is meant to accommodate gloves, as well. The grip, in relation to the trigger guard, allowed me to work the action while wearing winter gloves. Also, the magazine release button demands a push down, and no other motions, so it’s easy to accomplish in gloves, as well. Take the gloves off, and everything works even better. In summer heat, you’ll especially appreciate the slide serrations at the front and back of the slide, and the non-slip Tenifer coating on the slide and barrel. This coating resists corrosion from perspiration. 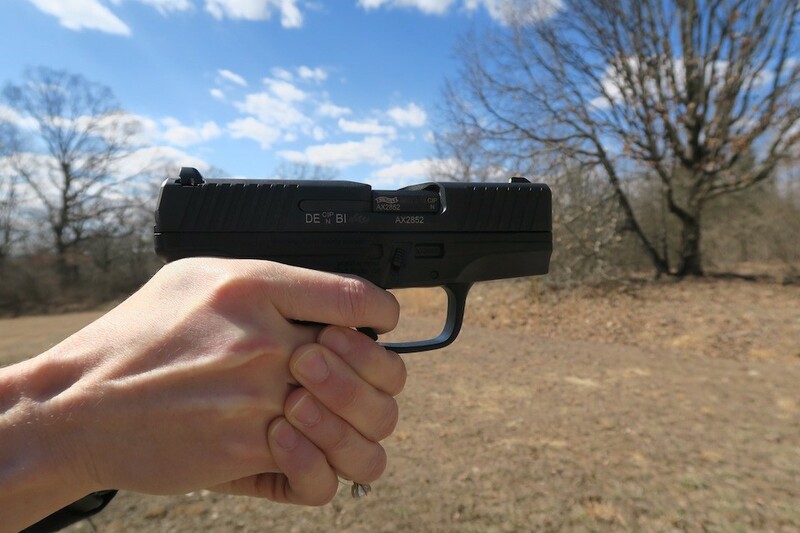 The 6.1-pound trigger pull is 2-stage, and short. I liked its re-set while going through the breaking in period, and then, the rapid-fire portion of the test. I would have liked to see a bilateral option for the magazine release, similar to what they did over on the CCP M2, and also, an option for a manual safety. The gun, like other polymer handguns, comes with an internal safety and one on the trigger itself. Height: Depending on which magazine you use, 4.4 inches/4.9 inches/5.3 inches. Sights: Three-dot metal sights, except on LE version, 3-dot phosphoroc sights. Rear sight screw is adjustable for windage. Low profile for no snagging. While on the range, I called in my reinforcement, since there were 3 guns. Hubby, formerly a member of the USAF Academy pistol shooting team and a good, strong, reliable shooter, offered to help break in the guns. We found that they fired accurately right out of the box, and still fired accurately after at least 200 rounds. Then, it came time to test the guns and their groups. 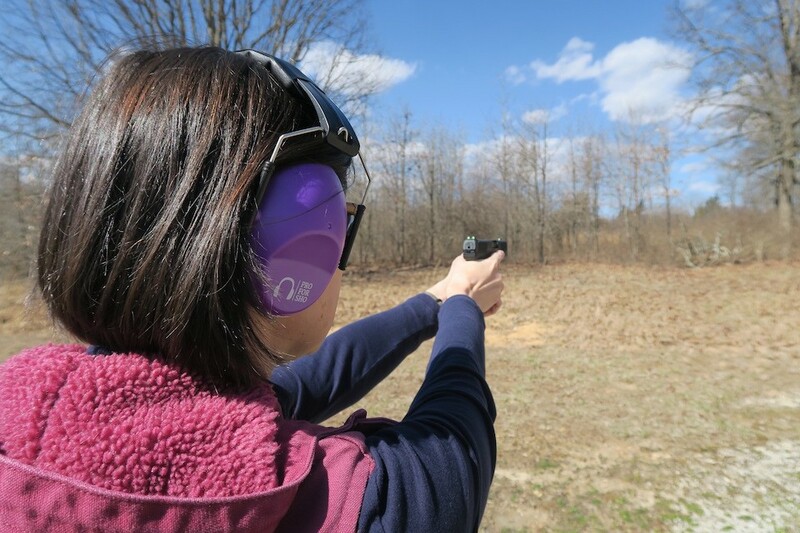 For this test, we took the target out to the standard concealed-carry distance of 7 yards, and shot the gun from a seated, bench-rest position. 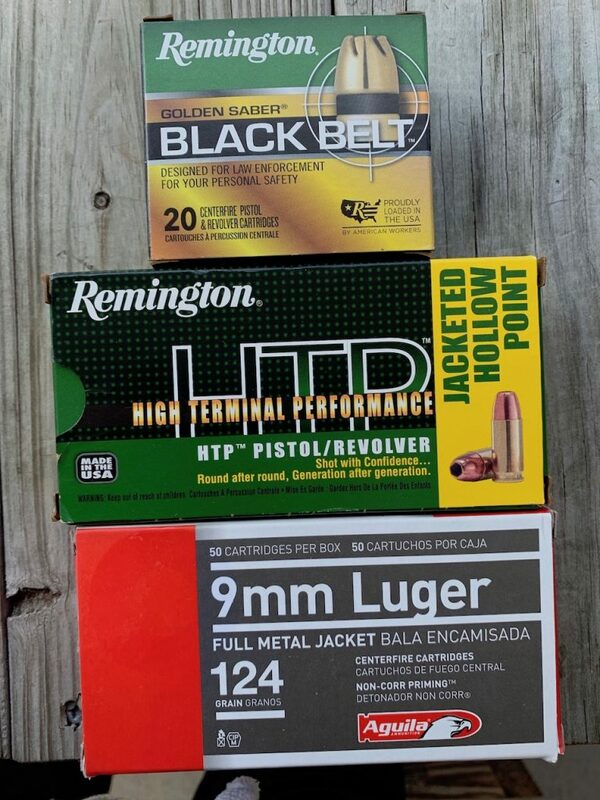 Aguila 9mm Luger, Full Metal Jacket, 124 grain: largest group – 1.25; smallest group – .5; average – 1.1. Remington High Terminal Performance, Jacketed Hollow Point, 115 grain: largest group – 1.25; smallest group – .5; average – .85. Remington Golden Saber Black Belt, Jacketed Hollow Point, 124 grain: largest group – 1.5; smallest group – .5; average – .75. Throughout the course of fire, we experienced not a single malfunction with any of the ammo used. That’s more than 1,000 rounds through 3 guns, and no malfunctions. I also ran this through rapid-fire, from 7 yards to center mass. It functioned reliably. There has been some complaining regarding Walther’s take-down of the old CCP. That problem does not exist here. It’s simple to use the take-down button and move the slide forward to disassemble this gun for cleaning. I tucked the gun into a Ramora holster, and drew it (dry fire) to practice. No problems, and I like how the grip is easy to achieve on the draw becaue of the angle of its design. Also, because of its low profile, it will fit easily into any of my carry bags or into a belly band. It’s truly an all-around gun, and if you’d like the 8-round option for a magazine, choose the LE version. Learn more about the Walther PPS M2 LE here.